O.Z.O. dog tags are not for sale at any price. Don’t ask. 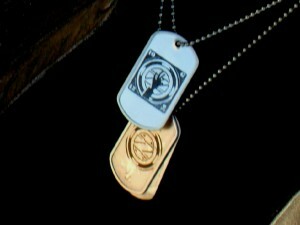 Above: Tags identify member as having attended “Operation Containment” as well as a group Advanced Scout. O.Z.O. Dog tags are earned. They cannot be bought. If you attend an O.Z.O. event, you may receive a set. If you have made a distinct achievement within the organization, you may receive a set in recognition. If you are part of a special sub-group within O.Z.O., you may receive a set. If you find someone selling a set of O.Z.O. dog tags, please notify us immediately and place that person under citizens arrest for forgery. If you are wearing an Outer Zone tag, you have bragging rights for the adventures you have had and accomplishments you have made… you did not buy that… You earned it! It is pretty simple. Unlike other organizations or events where you will pay to wear someone’s logo, we feel that is a cheapening of the person wearing them, and of the organization selling them, and will not sell them. Every O.Z.O. event and activity provides some form of physical and or mental challenge. The tags allow members to recognize what challenges others have endured, events they have attended, or merits they have achieved within O.Z.O. Some members of the organization bare heavy duty tags bearing the “Z” commander logo and their Outer Zone name. These tags are not for sale at any price. These tags are earned, and awarded on the basis of special Merit above and beyond. Those wearing these tags have put blood, sweat, and tears into the organization to see it be successful. They have spent hours upon hours organizing safe events for members, and have exhibited leadership and teamwork capabilities, and have endured hardships in doing so due to personal sacrifice. Those with commander tags have special honorary privileges from time to time, because they have earned it, and made sacrifices for the benefits of other members. 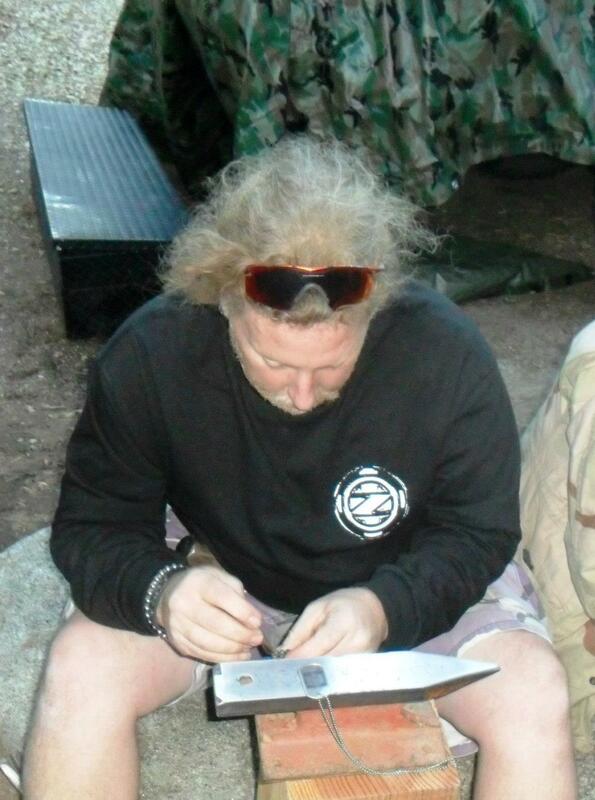 Occasionally at Outer Zone Overnight(TM) Events, we break out the anvil, hammer and metal stamps so that members can stamp their tags with initials, dates, etc. Here “CupCake” stamps his event earned tags at the TEOTWAWKI event. What is with the Industrial Strength Logo on the back of many of the dog tags? Long time organizational sponsor Industrial Strength body jewelry. 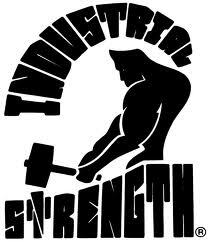 Industrial Strength Inc. is one of the very few approved sponsors of Outer Zone Overnight. Why? Because they get it. They support us… and they ask for nothing in return. They have supplied the organization with industrial power generation at events where needed time and time again, which has a fair market value of thousands of dollars. They have also provided the laser etching on the dog tags on multiple occasions at our request to match the themes of our events and merits. Their company owner is an O.Z.O. member, and loyal patron of the organization, who has provided much support since the organizations conception. In appreciation of Industrial Strength’s support of O.Z.O., we allow them to have their logo on the back of the dog tags and declare them an official organization sponsor. Their logo, is synonymous with endurance and quality, for which the O.Z.O. program is also known.